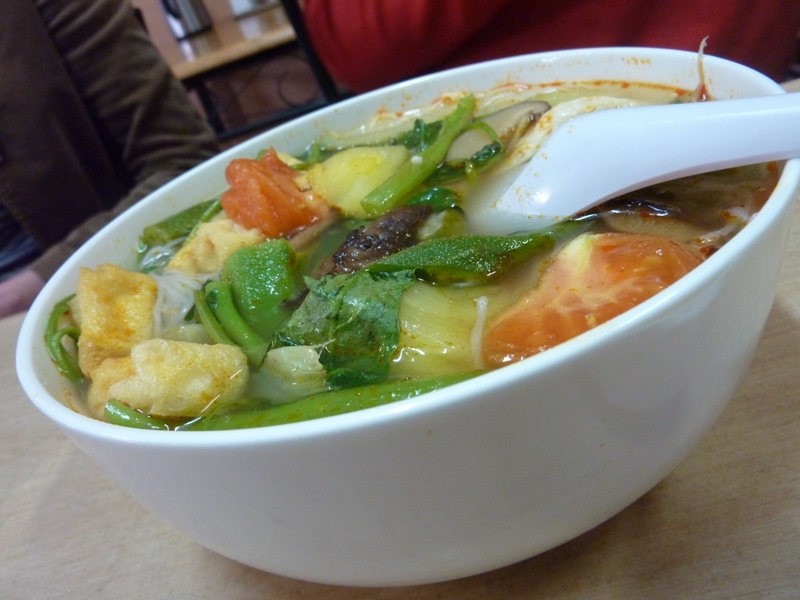 Canh Chua is one of the staple dishes of Southern Vietnamese cuisine, and is the kind of dish that is quite addictive. It is a sweet, clear and tangy soup made on fish stock, slightly sour through the judicious addition of tamarind pulp. On a very hot day it is almost the perfect thing to have for lunch, normally accompanied by grilled fish. It is a quintessentially Southern dish, though you will occasionally find it listed on menus in Central and Northern Vietnam. My advice is never to order it above Quy Nhon - I have had some disastrous encounters with Canh Chua in Hue and Hanoi. The amateur food historian in me says that it is probably a dish inherited from the Khmer, who serve up a similar sour soup called Samlor Mchou. It is also a distant cousin of the various tangy (and delicious) fish soups of Thailand, including the by-now universal Tom Yum. Canh Chua is normally made with a whole fish, though restaurants will sometimes make it with prawns - in Australia, even with chicken! It is filled with bean sprouts, pineapple, watercress, tomato and, for me, the two ultimate ingredients - bac ha and okra. This leaves you with a substantial and nutritious soup that could almost be consumed on its own with rice. Because it is so frequently made for lunch or dinner, my partner Thang tells me that one of the ultimate (and most delicious) of homemade snacks is bun canh chua, in which the leftover soup is re-heated and noodles are cooked in it. Because of its homemade nature (a kind of Vietnamese bubble and squeak) it is the kind of dish rarely served up in restaurants. But at Duy Linh vegetarian restaurant in Cabramatta they serve it up, and it makes for the most wonderful lunch all on its own. Indeed, it has become something of a signature dish for the restaurant. Now, a fish-based dish might seem hard to re-create as a vegan recipe, but in fact the soup's other strong sweet and sour flavours mean it can be re-created meat-free almost to perfection. Indeed, I actually prefer the vegetarian version. So next time you are out in Cabramatta, drop by Duy Linh vegetarian restaurant and try the Bun Canh Chua - noodles in traditional sour soup.